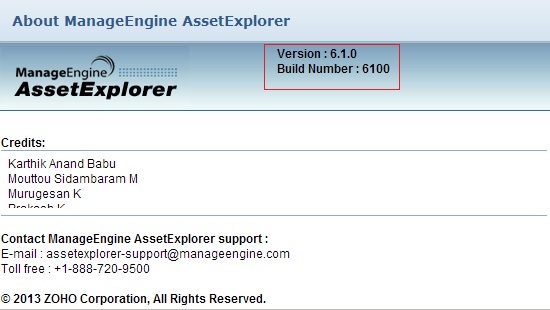 If you are a new user, download AssetExplorer directly. Customers using build 6116, ..., 6131 can install this Upgrade pack to migrate to Build 6132. Customers using build 6131,6132 can install this Upgrade pack to migrate to Build 6200. Customers using build 6200, ..., 6212 can install this Upgrade pack to migrate to Build 6213. NOTE: Taking a backup is essential to revert to the existing build without any loss of data if the upgrade fails due to unexpected reasons. The backup is stored under Backup folder in Assetexplorer Home directory. Run the script 'UpdateManager.bat (UpdateManager.sh for Linux) in the/bin folder. This opens the Update Manager tool. Click "Browse" to select the Upgrade Pack file (the .ppm file that you'd downloaded) and then click "Install"
Once the upgrade is complete, start AssetExplorer Server. How can I find the Build Number of AssetExplorer? In the AssetExplorer web client, click the "About" link at top right of the page.You should see the Build number mentioned on the top right of the page. Check the below image to locate the build number.